Samhain. (2011). In Morton, The Halloween encyclopedia. (2nd ed.). [Online]. Jefferson: McFarland. Available from: https://search.credoreference.com/content/topic/samhain [Accessed 21 April 2019]. "Samhain." The Halloween Encyclopedia, Morton, McFarland, 2nd edition, 2011. Credo Reference, https://search.credoreference.com/content/topic/samhain. Accessed 21 Apr. 2019. 1 November, observed by the ancient Celts as a festival marking the end of the harvest period and the beginning of the CELTIC New Year. With the coming of Christianity in Britain it became widely subsumed under the observations of HALLOWEEN and ALL HALLOWS DAY. The name is pronounced ‘sown’, rhyming with ‘frown’ and ‘gown’, or ‘sow-in’. (variations: Saman, Samain, Samonios, Samuin, Samhuin, Samhuinn, Samhtheine, Sainfuin, La Samon, La Samhin, Sham-in, Saimhain, Samhein, Oiche Shamhna, Taman; also known as Nos Calan Gaeaf (Welsh); pronounced “sow-en”) — The Celtic New Year's festival (and the first day of Gemred, or winter) and arguably the single biggest influence on the contemporary celebration of Halloween. In reality, there was probably no single god worshipped on this day, and the Celts had no “god of the dead.” Likewise, after Vallancey it was commonly stated that on this night “the lord of death gathered together all the souls of all those who had died in the passing year and had been condemned to live in the bodies of animals, to decree what forms they should inhabit for the next twelve months” (from Ruth Edna Kelley's The Book of Hallowe'en, 1919); but beyond Vallancey's suppositions there is no evidence to support this idea, either. Samhain translates as “summer's end”; in Gaelic, Lá Samhna is the name given to the first of November, and samhradh is the name for summer. In Celtic tradition, Samhain was the greatest of four ceann fÉile, or chief festivals (or quarter days) held by the Celts (the others were Imbolc —later St. Brigid's Day —on February 1, Beltane or Beltene on May 1, and Lughnasad on August 1, when first fruits were celebrated). All Celtic festivals were associated with either agriculture or livestock; Beltane (when crops were planted and livestock put out to pasture) and Samhain (when the livestock were brought in for the winter) were the main calendar points, and Imbolc (associated with the lactation of ewes) and Lughnasad (a midsummer celebration) marked three-month points in between. Surprisingly little is known of the actual rites and activities of Samhain, since the Celts kept oral rather than written histories; in fact, there is no indication that mainland European Celts celebrated the day at all, and it may have been a festival originally celebrated only by the Irish Celts. What is recorded about Samhain is found largely in the vernacular literature of the Celts, which was first recorded by monks and so is usually thought to be somewhat colored by Christian interpretation. For the Celts, Samhain (the celebration of which is mentioned in the Celtic mythology as lasting for three days before and three days after the actual day itself) probably began with bringing the livestock in from the fields for the winter; the hardiest were kept as breeding stock, while the weakest were slaughtered, partly to provide provisions for the winter and partly because it was difficult to provide feed for animals in the winter months. This tradition of slaughtering livestock at Samhain time carried on in many parts of Britain; for example, until the 1930s most villages in the Wiltshire area had an official pig-killer who was always extremely busy at this season. The last of the harvest—barley, apples, oats, wheat, turnips—was also brought in at this time (the Celts may have shared the later Irish belief that any crops left out after November 1 were rendered inedible by malicious spirits or fairies). Romantic nineteenth-century depiction of the type of ritual the Druids might have practiced on Samhain. The rest of Samhain was devoted to a mix of political and religious activities. A great assembly of the five Irish provinces was held at Tara (or Teamhair, sometimes also called Druim Cain, the beautiful ridge; Liath Druim, the grey ridge; and Druim na Descan, the ridge at the outlook). Tara was the seat of the high kings of first the crude Firbolgs, then later the great Tuatha de Danaan; the Samhain festivities held there included horse races, markets, political discussion, feasting and drinking (some folklorists have stated that the Samhain assembly may have lasted over a fortnight, and was celebrated only every three years). In one Celtic myth the young hero Finn MacCumal, goes at Samhain time to the assembly and encounters a law that states that no one there may raise a quarrel or bring a grudge against another as long as the gathering goes on. Samhain feasts were often held on the shores of lakes (bodies of water such as wells, lakes and rivers were held in great reverence by the Celts); for example, The Dream of Angus occurs on the shore of Loch Bel Dracon. On the evening of October 31 (since the Celts reckoned time by nights instead of days, their actual Samhain may have been the evening of October 31), all fires were extinguished, and then the Druids, or priests, enacted a ritual in which a new fire was kindled on the hill of Tlachtga (about 12 miles from Tara). Embers from this fire were distributed to each home (which paid a tax to the king in return) to start their own fires anew. Historical tradition has it that debts were paid on this day and duties honored (a tradition which was continued in the later celebration of Martinmas); any who refused to do so might be excommunicated (a fate which also awaited any who had dealings with those already excommunicated). Samhain's most significant aspect, however, was probably not political but spiritual. The Druids would have performed sacrifices on this night, hoping to propitiate the gods into gifting their people with a mild winter; sacrifices may have included human offerings, perhaps even the infamous “wicker man” described by Roman historians—a large man-shaped figure made from wicker, in which sacrificial animals and people were caged and then burned (other accounts suggest that the Druids sacrificed black sheep on this night). The Celts, who often dug ritual pits, may have placed seed in such shafts or pits on Samhain, to ensure fertility come spring (when some of the seed was removed for sowing and replaced with a second offering). On this date the Dagda and the Morrigan (chief male and female deities) copulated to ensure crop and animal fertility for the coming year (one variant of this tale describes the Morrigan as having one foot on either side of a river). In some versions of this myth the goddess, an old hag by year's end, is revitalized by the union, becoming young and beautiful again. As the border between two years, it was believed that Samhain was a night when the entrances to the Otherworld were open, and the spirits of the dead could roam free. The dead were commemorated (there were also similar activities at Lughnasad), and it was customary to put food out for spirits returning home. The dead, however, could also be malicious tricksters, like non-human supernatural entities, and so Samhain Eve was a night to stay indoors. 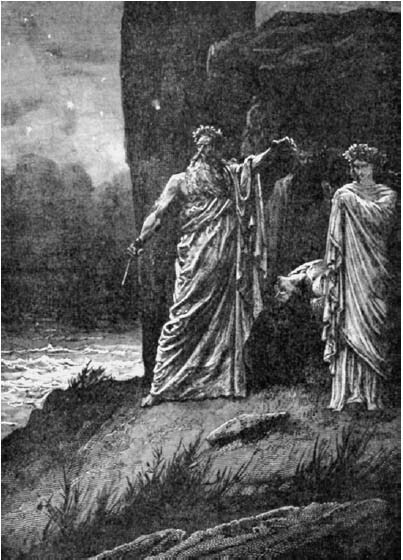 The Celtic vision of the afterlife was largely benevolent: One description of Annwn (the Otherworld) was “Court of Intoxication,” since it was a place where heroes feasted and drank with beautiful women and sometimes fought; but it could also be fraught with danger, since mortals entering the realm of the Otherworld might come across horrific monsters, and were often condemned to stay, never aging, until they tried to return to their own land, where they died instantly. The Celts had a rich mythology, in which Samhain figured prominently. It first appeared when the Tuatha de Danaan (or the Celts’ gods and goddesses) took Ireland from the Firbolgs; the Tuatha de Danaan were then beset by the nightmarish Fomorians, maimed monsters who each had only one leg or one arm and were led by an evil giant and his mother. The Fomorians demanded a ritual tribute each Samhain of two-thirds of the Tuatha de Danaan's corn, milk, and children. The Tuatha de Danaan battled against the Fomorians, and although the monsters were largely defeated they still roamed the Irish countryside, spoiling corn, milk, fruit and fish. Finally one Samhain night the Morrigan and Angus Og drove the last of the creatures from Ireland, and the Fomorians returned to their kingdom from beyond the sea. Some Samhain myths center on legendary feats, such as Finn's slaying of the murderous Aillen, or Nera leading an army into the Otherworld on a quest for a great crown; others involve meetings between mortal men and women of the sidhe (fairies). In this latter vein is the tale of Fingin Mac Luchta, who is visited by a banshee (fairy woman) every Samhain who tells him all the precious things to be found in the royal strongholds of Ireland, as well as prophecies for the coming year. These meetings between mortal man and fairy woman are not always romantic, though: In the one story set at the Cruachan of Connaught, Cailte and Cascorach the Musician meet an old man who turns out to be Bairnech, steward to the King of Ireland. Bairnech tells them that every year at Samhain a woman comes out of the hill of the Sidhe of Cruachan and brings away nine of the best cattle from every herd. Since it is Samhain night, Cascorach goes to the door and kills the banshee with his spear. Another Samhain story emphasizes the involvement of Druids with the holiday: On Samhain Eve Dathi, king of Ireland (from A.D. 405 to 428) was at Cnoc-nan-druad (“the Druids’ Hill,” now Mallaroe); he ordered his Druid to forecast the events of the coming year. The Druid went to the summit of the hill, spent the night there and returned at sunrise, only to address Dathi as King of Erin (Ireland) and Alban (Scotland). He thus correctly predicted Dathi's conquering expedition to Alban, Britain and Gaul. Another tie between Druids and Samhain was the idea of fe-fiada, a spell that some believed the Druids cast on fairies to render them invisible throughout the year; only on Samhain was this spell lifted. One of the most frightening (and one of the oldest) Samhain stories is found in the Dinnsenchus in the Book of Leinster. It tells of how King Tigernmas (who ruled Ireland around 939 b.c.) and many of his people were destroyed by some mysterious force as they worshipped an idol (given as Cromm Cruach) on Samhain Eve; they may have been destroyed by vengeful Druids, who were angry that Tigernmas had turned away from them. When the Julian calendar was replaced by the Gregorian calendar in the mid-eighteenth century British Isles, it essentially created two Samhain celebrations, with November 11 henceforth being known as Oíche Shean Shamhain, or “Old Samhain Eve,” and November 12 as Lá Shean Shamain, or “Old Samhain Day.” Most customs and beliefs regarding Samhain and Halloween transferred to the “new” October 31 or November 1, while in most areas November 11 came to be celebrated as Martinmas. Although Samhain was largely incorporated into the Christian holidays of All Saints’ Day and All Souls’ Day, it has been celebrated from Celtic times under its original name in certain areas of Ireland. It is also celebrated as Samhain by some contemporary Wicca, Neo-Pagan and Neo-Druid groups.